Prof. Steve Mann, PhD (MIT), P.Eng. (Ontario), is widely regarded as „The Father of Wearable Computing” [IEEE ISSCC 2000]. His work as an artist, scientist, designer, and inventor made Toronto the world’s epicentre of wearable technologies back in the 1980s. In 1992 Mann took this invention from Toronto to Massachusetts Institute of Technology, founding the MIT Media Lab’s Wearable Computing project as its first member. In the words of the Lab’s founding Director, Nicholas Negroponte: „Steve Mann is the perfect example of someone… who persisted in his vision and ended up founding a new discipline.”. Mann also invented the smartwatch videophone (wearable computer) in 1998, which was featured on the cover of Linux Journal in 2000, and presented at IEEE ISSCC2000, 2000 February 7, where he was named „The Father of Wearable Computing”. Some of Mann’s other inventions include HDR (High Dynamic Range) Imaging, now used in nearly every commercially manufactured camera, and the EyeTap Digital Eye Glass which predates the Google Glass by 30 years. Now as the Chief Scientist at Meta, a California-based startup, wearable AR glasses will be brought to a mass market. Recently, Steve (as one of the co-founders, and as the Chief Scientist) and his team successfully raised US$73 million in funding to support MetaVision digital eye glass. In 2013, Mann brought together the world’s leading thinkers in cyborg ethics, veillance (surveillance and sousveillance), and HI (Humanistic Intelligence), for the IEEE ISTAS, resulting in the world’s first set of ethical principles for transhumanistic intelligence and metasensory augmentation. More than 40 years ago, in his childhood, Mann invented the Sequential Wave Imprinting Machine, combined with wearable augmented reality to measure the speed of sound and the speed of light, and, more importantly, to cancel the propagatory effects of sound waves and radio waves and make the waves be visible sitting still as augmented reality overlays. Steve received his PhD from MIT in 1997 and then returned to Toronto in 1998, creating the world’s first Mobile Apps Lab (1999) as a part of his wearable computing and AR course at University of Toronto, where he is a tenured full professor in the Department of Electrical and Computer Engineering with cross-appointments to Computer Science and MIE (Mechanical and Industrial Engineering. Mann is presently a Visiting Full Professor at Stanford University Department of Electrical Engineering (Room 216, David Packard Building, 350 Serra Mall, Stanford, CA 94305). He is also the Chief Scientist at the Creative Destruction Lab at Rotman’s School of Management. 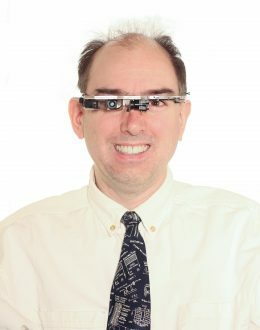 Mann holds multiple patents, and has contributed to the founding of numerous companies including InteraXON, makers of Muse, „The Most Important Wearable of 2014”. Mann is also the recipient of the 2015 Digital Pioneer Award.